Neuro:On – Technology You Won’t Lose Sleep Over! Technology was supposed to make things quicker and easier, but it seems that we’ve never been busier. We work long hours, take fewer vacations, and seem to have no time for anything anymore. When I find the need for extra time, the first area of my life that gets robbed is my sleep time. That cant be good, can it? 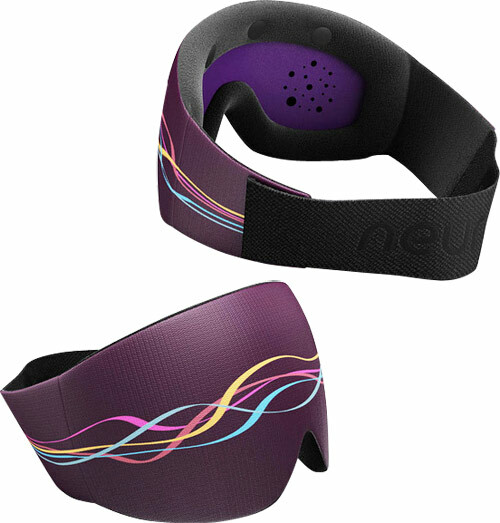 Well, there is one gadget that might make it okay, check out the Neuro:On, a wearable sleep mask thats is actually a medical quality sleep manager that promises to help you sleep less, but much more efficiently. The Neuro:On is sure to help you get more out of each nights slumber, and allow you to wake up feeling surprisingly refreshed, energized, and ready to seize the day! This comfortable mask measures many of your biological processes inherent to good sleep, such as body temperature, brain waves, eye movements, pulse, and even muscle tension in order to deliver personal recommendations on how to optimize your sleep time, combat jetlag, deliver important sleep data, and to wake you up ever so gently, and at the appropriate time, so you wake up without that horrible groggy feeling that you’ve been drinking buckets of coffee to get rid of. So, if you would like an actual sleep monitor, one that does a whole lot more than any old wristband device, including gently rousing you with artificial dawn technology, look into the Nuero:On. Available for pre-order at neuroon.com for just under 300 bucks, and with shipping beginning the first quarter of 2015. Nighty-night!